Keskimääräisesti, käyttäjät antavat tälle tuotteelle arvosanaksi 77/100. 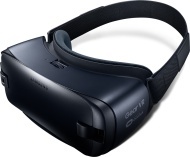 Samsung has made a habit of giving its Gear VR headset minor updates with every flagship phone launch. And it's done the same for the new Galaxy S8 and S8+ – although not a whole lot has changed. For anyone interested in purchasing a VR headset and who's already a Samsung flagship owner, the Gear VR is a no-brainer. It's easy to use and the content selection keeps growing. There's plenty of appeal here. There aren't many pieces of technology that literally make people's jaw drop. That make friends say, "let me see that again." That make kids feel like they're in Disneyland. That make moms and dads and grandparents go, "wow, I can't believe this." Amazingly immersive virtual-reality effects, despite running off a phone; lots of free content; well-designed headset; works with Android Bluetooth game controllers. Some panoramic videos still look pixelated compared to what you'd experience on a high-end phone or tablet; only works with particular Samsung phones; won't work with Google Cardboard apps. While it might soon be eclipsed by more robust competitors, the Samsung Gear VR still amazes as the most impressive virtual reality you can buy right now. It's a relatively affordable VR accessory; it creates a better-than-expected sense of immersion using a Note 4 as its screen and engine; apps, while limited, are all free. And it's actually available to purchase now. It only works with the Samsung Galaxy Note 4; the app assortment consists mainly of demos and quick minigames; its video resolution in VR still grainy, compared with TVs and tablets. It doesn't work with full-fledged PC-based Oculus software. The Gear VR Innovator Edition is a cool -- and very promising -- entry ticket for early adopters looking for an affordable taste of virtual reality. The first time we slipped the Gear VR on and literally looked around a whole virtual galaxy, head turning to take in what was to the side and behind, a part of us was impressed with the sheer spectacle. It's quite amazing. VR still has a long way to go, and not a lot of people will buy this... but if you buy an S6 you definitely should think about it.